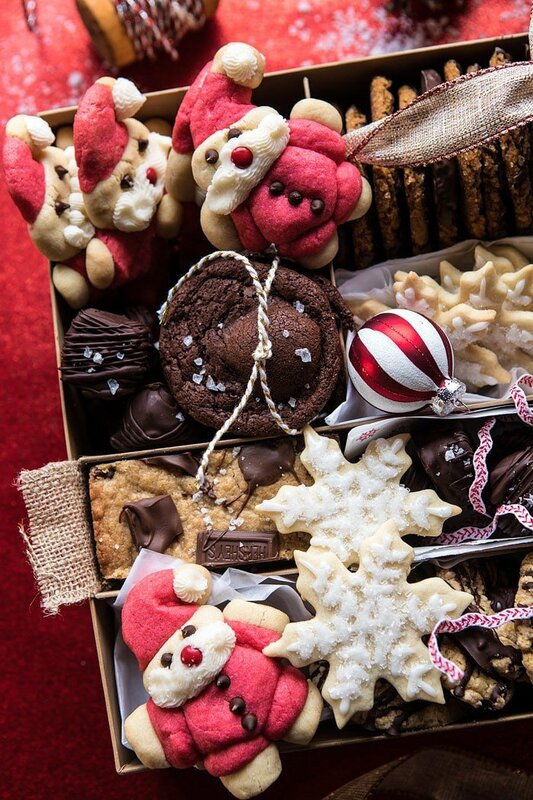 Today’s the day…yes, I am finally sharing my ideas on How To Create the Best Holiday Cookie Box! Here’s the thing, baking cookies and putting them in a box isn’t really a hard thing to do, right? Yeah, we get that. But baking cookies and arranging them in the box, not only to look cute but also be protected, and then properly shipping them off…well that can be a little tricky. One of my favorite Christmas traditions is shipping out Christmas cookie boxes to friends, family, and people I work with. I’ve been doing this for a few years now and it’s become one of my favorite December activities. I love setting aside a day just for baking cookies, it’s the best. Last year, I was so bummed when I didn’t have time to bake up any cookies, so this year I am making a serious effort to bake all the cookies I can, and get some boxes shipped out. Over the years, I’ve learned a few tips and tricks to creating the perfect cookie box, so I thought it would be fun to share them with you guys. 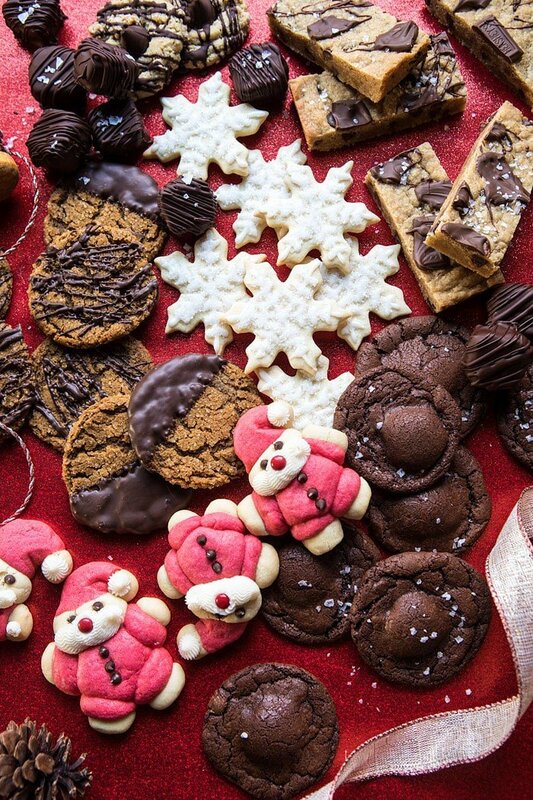 Here’s how I go about creating the perfect holiday cookie box. 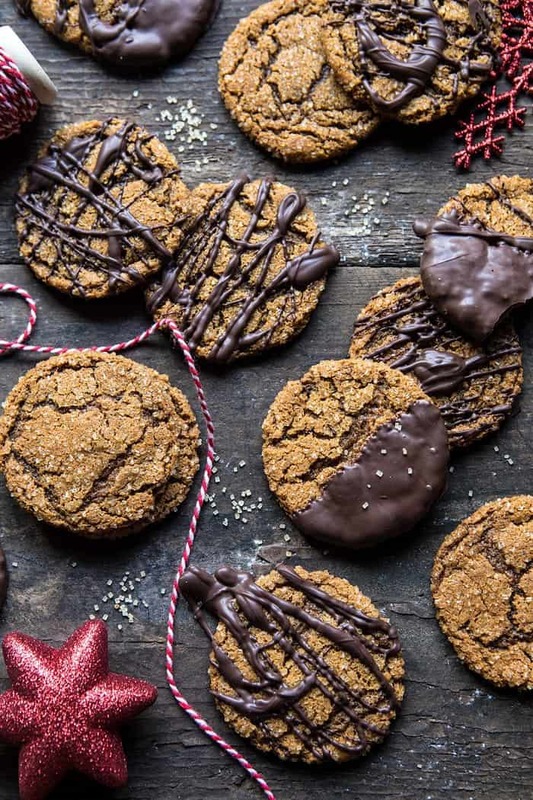 When choosing your cookies, be sure to pick cookies, and or other desserts, that will hold up well in shipping. I like to choose cookies that are different shapes and sizes. I find it’s nice to have a little variety in the box, so I’ll normally bake up four to six different cookies and then divide them between boxes. The box you use to package your cookies is very important. You’ll want to choose a sturdy box that can handle shipping. I love using a heavy-duty cardboard box that has dividers in it so that I can keep each cookie separate from one other. I also love using a good cookie tin. Both are great options for keeping cookies safe. 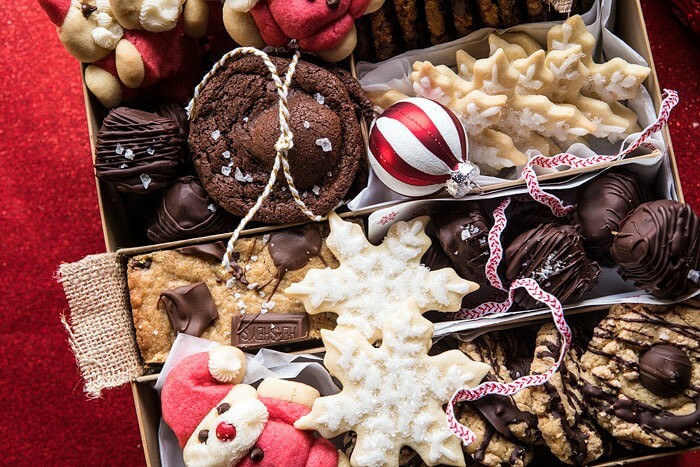 Tip: place bubble wrap in the bottom of your box, then line the box with a very large piece of plastic wrap (use multiple layers if needed) that will be large enough to wrap over the cookies when the box is full. This keeps the cookies safe and fresh. Of course I love to make my boxes as cute as possible, so I try to find festive plastic wrapping, food safe tissue paper, and or ribbon to wrap around my cookies. This gives your boxes that extra special touch…plus it’s just fun. Tip: I always wrap cookies that I want to stay extra fresh in holiday ziplock storage bags and then add them to the box. 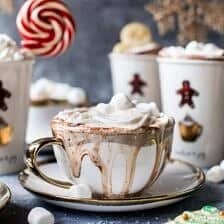 If you want to use something a little cuter than storage bags or plastic wrap, try using holiday cellophane bags that can be sealed with ribbon, small holiday cookie tins or food containers that will fit inside your box. As I mentioned, I love setting an entire day aside for baking cookies. Normally, Asher will come over and we’ll have a “Christmas Cookie Day”. We bake, listen to Christmas music, and eat our body weight in sugar. 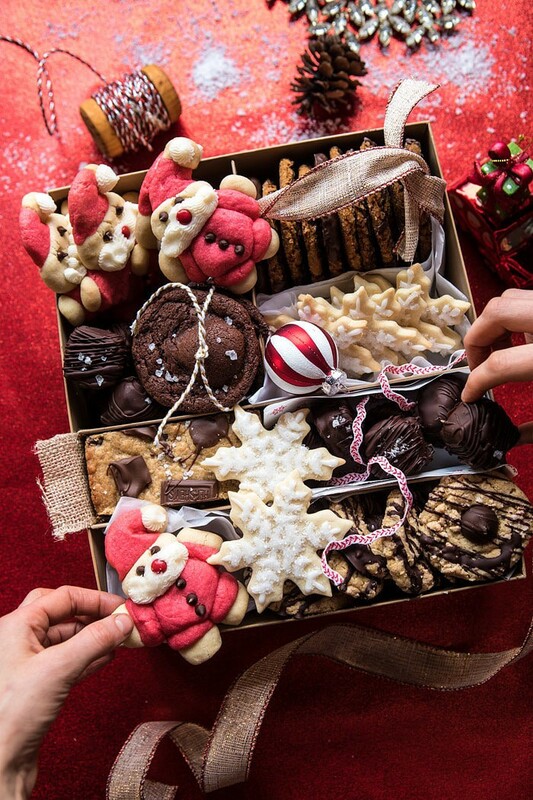 It’s a fun way to get a lot of cookies baked and decorated and get the boxes filled. 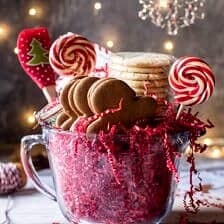 I like to bake and decorate the cookies in the morning and afternoon, then let them chill and package them up at night so that they are ready to ship in the morning. 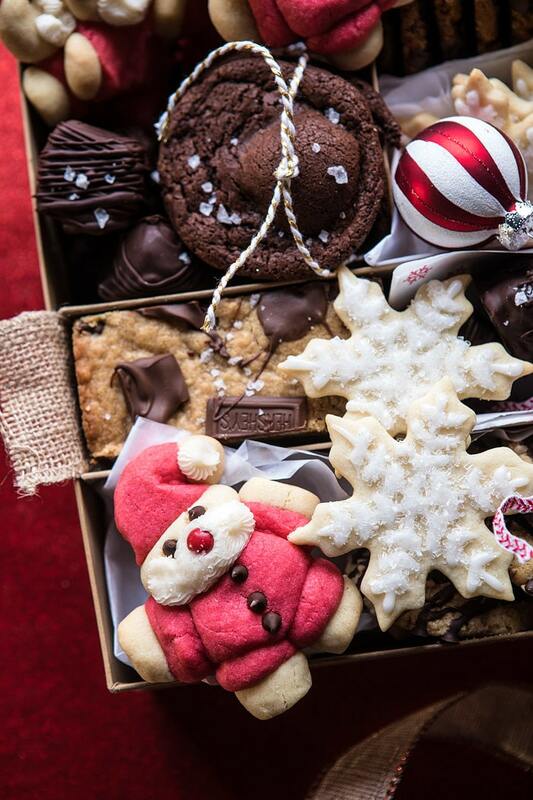 Packing up your boxes is probably one of the trickiest steps of sending out holiday cookie boxes. 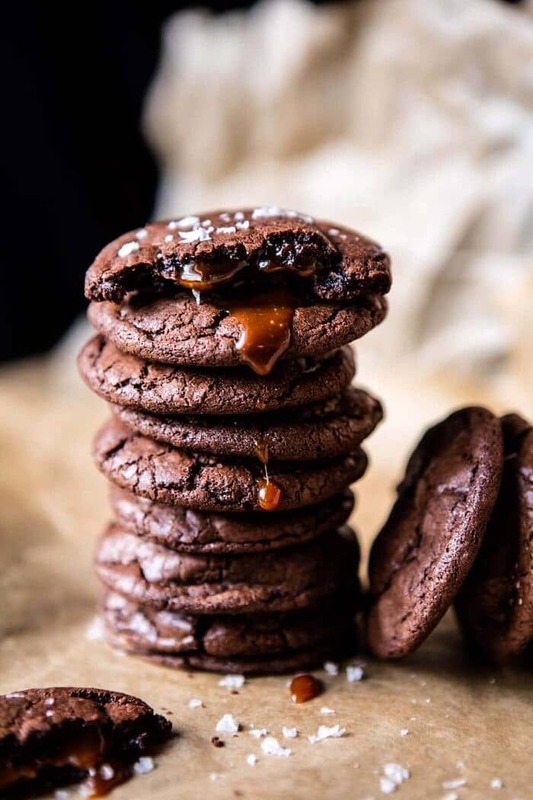 You’ll want to make sure that all the time you spent making cookies wasn’t wasted, trust me, the worst thing ever is to hear that your cookies arrived smashed. 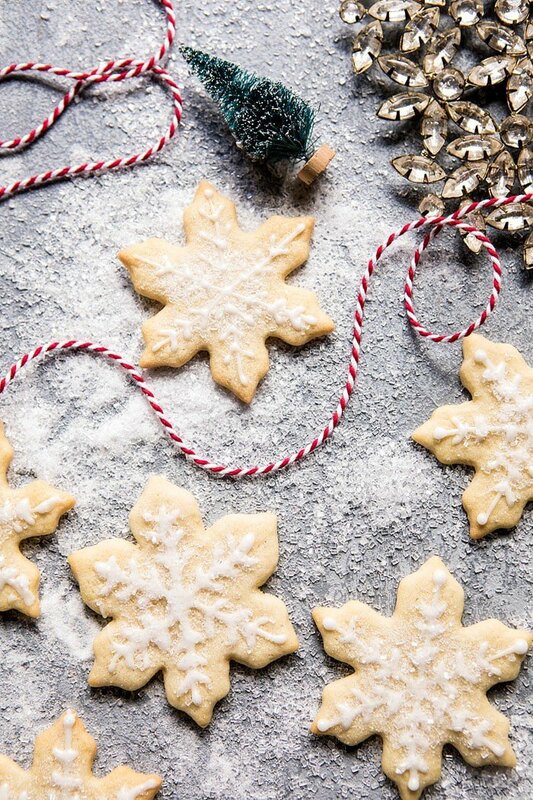 Start out by wrapping any cookies that are more fragile in plastic wrap or plastic food bags. Be sure to package the heaviest cookies on the bottom and the lightest cookies on top. 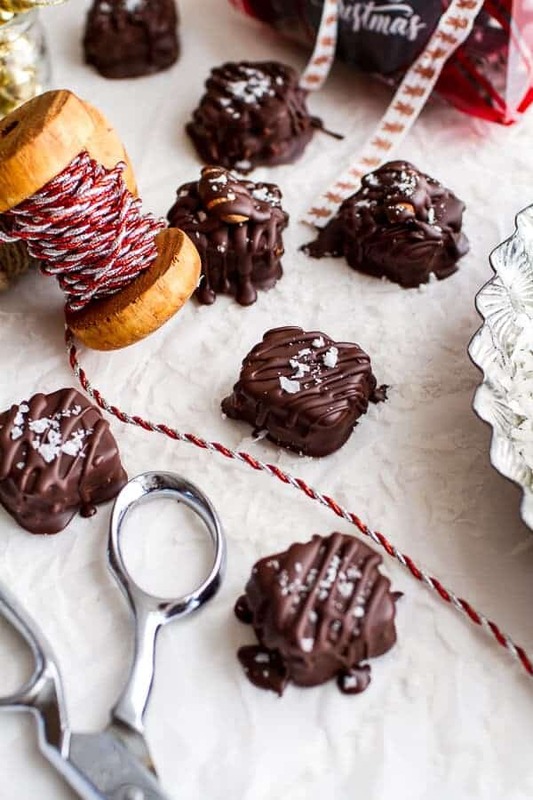 Arrange a layer of shredded paper, bubble wrap, or tissue paper between each new layer of cookies. 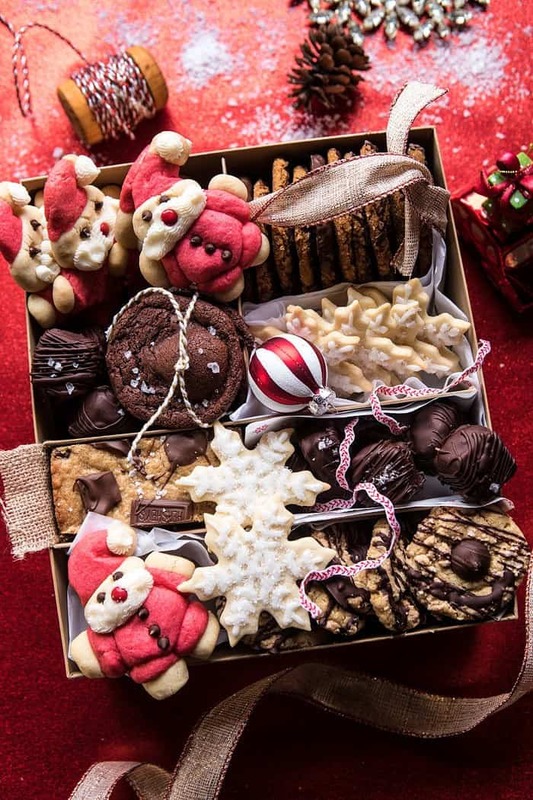 Pack your cookies snug in your box to keep them from moving during shipping. For the final layer of your box, I like to use shredded paper, bubble wrap, or tissue paper. This will help keep the cookies snug in their place. Pack the box inside a large cardboard box with about two inches of space all around and fill in the empty space with bubble wrap, as this provides just another layer of protection for your cookies. Seal the box well with tape and then write FRAGILE all over the box. No seriously like all over the box, and in BOLD letters. I bake my cookies and package them up all in one day, and then the next morning I head to UPS or Fed-EX to ship them off. My recommendations? Do not use the USPS to ship your cookies, that just never, ever, ends well. Ship your cookies via two-day air because it’s important to get your cookies to their owner as soon as possible. I know it’s a bit of work to create a holiday cookie box, but the efforts are worth it. I continually find that whoever receives a box is always so happy and grateful for the homemade goodies. 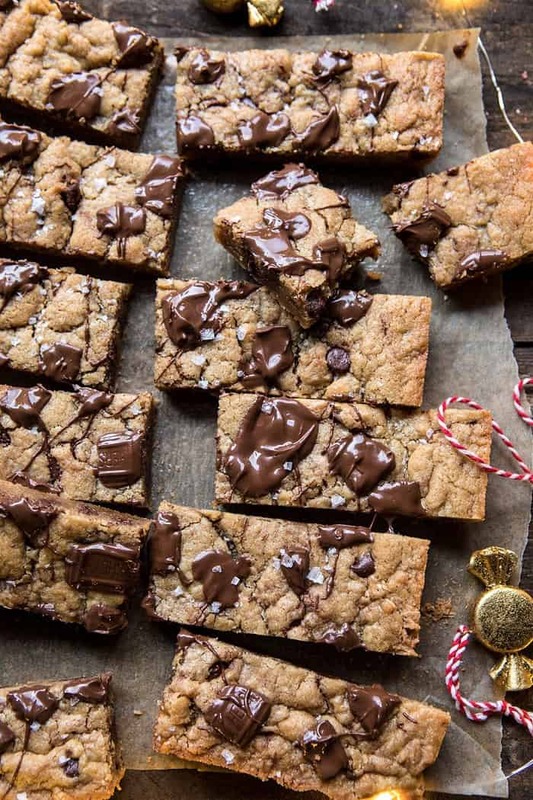 And guys, you don’t have to bake a ton of cookies for your boxes. One, two, three, types of cookies is fine! 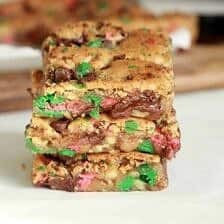 I hope this post inspires you guys to get into the kitchen and bake up some cookies for friends and family! Thank you so much for all these tips! I love the Santa cookies, so cute! 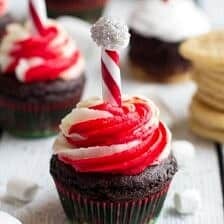 Such a fun, delicious holiday gift idea! 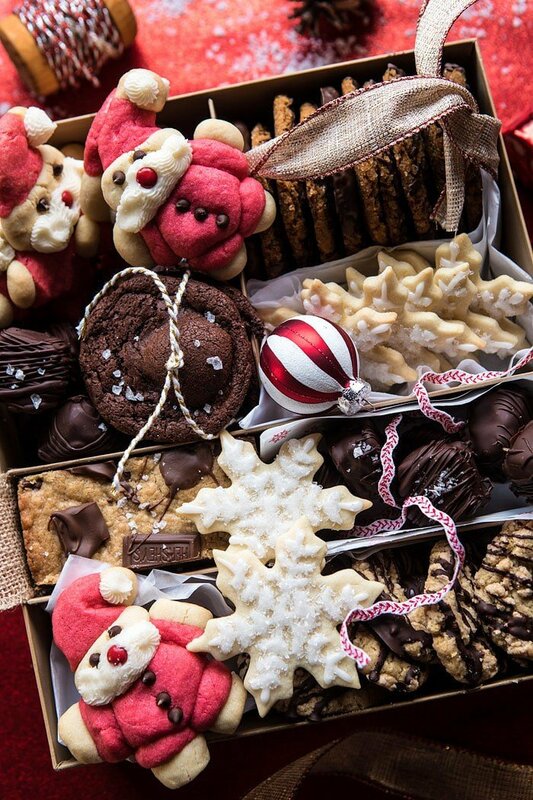 I would sure love to get a Holiday Cookie Box from you! It’s so appealing and professionally done! Thanks for sharing your tips, Tieghan! O.M.G. If only I were on your Christmas cookie list! I am now officially inspired to take on my Christmas baking. 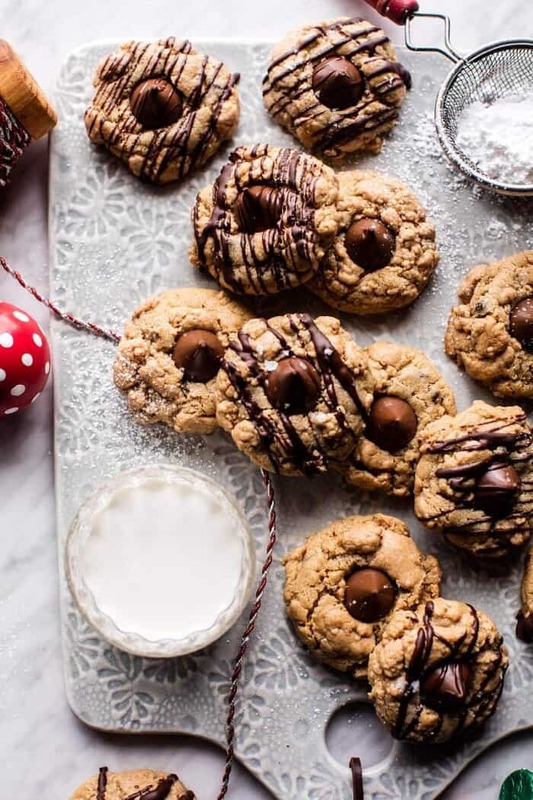 Those Santa cookies are on the top of my must-try list! Great! I hope you love them! Thank you Rosemary! Anyone would be so lucky to be a recipient of your delicious and gorgeous cookie boxes! What a wonderfully detailed post. Love your blog! Awh that is so sweet of you! I hope they love the cookies, thanks June! Omg, I’m speechless by how much I adore this whole idea, Tieghan! Thanks girl, this is the best! That is so nice of you. I am sorry that you can no longer bake, but I am glad you have the memories with you still. Thank you for sharing that Jill, Merry Christmas! I love your Christmas cookie boxes! That’s nice that you were able to ship them to everyone and have a cookie decorating day! I also baked cookies today (for my mom), listened to Christmas music, and made homemade hot chocolate. 🙂 It was nice to bake holiday cookies and I’m looking forward to baking more, while I can. I agree that packaging them is tough, and they seem to get easily squished. I hope you’re enjoying your guests and having a restful night. Hi! I am so glad you like these! Thank you! I bet that goat cookie cutter is going to make such cute cookies! Thanks Kristin! What a cute present! Nothing warms my heart more than a box where I can make my own delicious creations, or I receive creations that are WAY more beautiful and tasty than I would have ever made them! Yes! I am so glad you like this! Thank you! Where do you get a heavy-duty cardboard box that has dividers? Love your box…do tell your source please! Will you please share specific cardboard box recommendations/where you find yours with these dividers? Thanks so cozily!! Goodness gracious, now that I post your site jumps to the bottom of this page and I see indeed someone JUST asked you the same question. Haha, sorry to be repetitive! We obviously are very eager to know! 😉 Stockings of thanks!! Where do you get your cookie boxes from? Or are they more of a DIY? Absolutely love this!!! Going to do this for my husbands command! Where do you get your sturdy box from? When can I expect delivery?😊. Sure wish that box of deliciousness was coming to my house! Thanks for all the great tips and recipes. So wish I could give you all one! I am so glad you like this Debbie! Thank you! Would love to know where you get the heavy-duty cardboard box from! Thank you! I really like that you manage to bake so many cookies in one day. I think it’s wise that you aren’t doing all decorated cookies, as icing takes so long to do and to dry. You inspire me to try to make a bunch at once again; I haven’t since I made that box for friends in France earlier this year! That is so awesome of you Brandy! Thank you so much for sharing those Target boxes, I am sure that will come in handy for many! Hi, your cookie box looks amazing. Could you tell me how you created it and where you got the dividers from. I can’t find any cookie boxes that have dividers for separate bakes. Love your tips but please add some pictures of your actual packaging & process steps. I can only imagine sending three cookies with all of these layers! Thank you so much CJ! I am so glad you love this box! Thank you so much Taly! These are gorgeous photographs, but as another commenter said, could you please add some pictures of how they actually look when shipped? It would be a lot more helpful if the pictures actually matched the tips. Hi Laura! I will try to do that for the next time I do a cookie box! It really is a good idea! I’m having a hard time finding sturdy boxes with dividers like the ones in the post. Do you have any links or tips on where to buy? On amazon I’m seeing huge shipping boxes, or flimsy cookie display type boxes, not much in between.